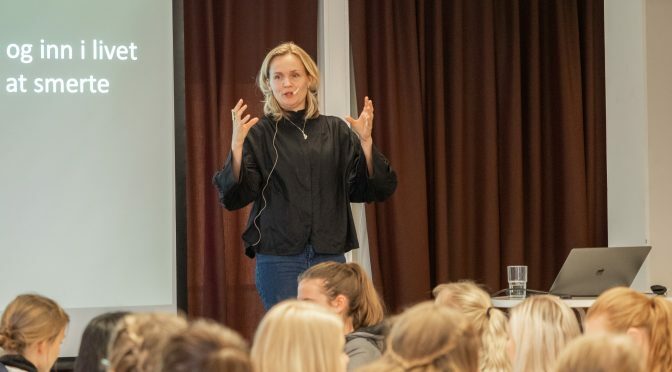 On the occasion of the International Day of mental health, MSH (Moldestudentenes Helseutvalg) organized an event “Generosity is Gold.” Yesterday, psychologist Marie Midtsund talked to students about the importance of mental health. New surrounding, new friends, new social groups – there is a lot of pressure for students. “It is normal to feel stressed and have crisis. That’s a normal reaction to such situation and it is not dangerous,” says Midtsund. “Those feelings are part of life. Students are in stressful environment,” she added. We all know what is she talking about. Scrolling trough your Instagram feed, seeing others travelling the world, sharing their successes and smiling, can create an impression that is the only right way to live. Our mental suffering also affects our physical heath. Just imagine what happens if you scared. “We cannot separate mental health from the physical one,” Midtsund pointed out: “Mental pain is as bad as physical pain.” The feeling of pain is very subjective and no one can scale it. “Try to accept it instead of trying to avoid it. Pain is natural part of living, and suppressing it causes even more pain,” Midtsund said. The number of people who struggle with mental problems is stable. What has increased is the number of people who receive a treatment. Also, it is more acceptable to talk about these kinds of issues nowadays, so we might have a feeling that the presence of mental health problems have increased. “Mental issues affect both genders, the presumptions that women are more susceptible, is wrong,” warned Midtsund. If you need someone to talk to, you can reach HiMolde’s student counselor Eva-Merete. Her office is open every day from 9 till 3 pm. You will find her on 2nd floor of A building in room 233. You can also contact her via e-mail.